There are two methods to seal KERDI to a bathtub. 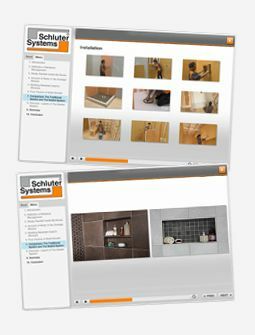 Please refer to the Schluter®-Shower System Installation Handbook for complete details and installation instructions. Leave a 1/4″ (6 mm) gap between the solid backing and the tub deck. Place painter’s tape to protect the tub deck. Completely fill the gap between the solid backing and tub using Schluter®-KERDI-FIX or other suitable sealant. Apply Schluter SET™, ALL-SET™, FAST-SET™ or unmodified thin-set mortar to the solid backing using a ¼" x 3/16" (6 mm x 5 mm) V-notched trowel or the Schluter®-KERDI-TROWEL. Apply KERDI-BAND waterproofing strips or 5" (125 mm)-wide cut sections of KERDI waterproofing membrane. Solidly embed the membrane in the mortar and KERDI-FIX to ensure full coverage and remove air pockets. Apply KERDI-FIX or other suitable sealant to the lip of the tub and spread using a small notched trowel. Apply Schluter SET™, ALL-SET™, FAST-SET™ or unmodified thin-set mortar to the solid backing using a ¼" x 3/16" (6 mm x 5 mm) V-notched trowel or the KERDI-TROWEL.